There are over 2,000 add-on modules available for Drupal to extend its functionality in various ways. Both new users and seasoned developers alike struggle with what modules to use for which types of projects, and how to combine various "building block" architecture modules in useful and interesting ways. 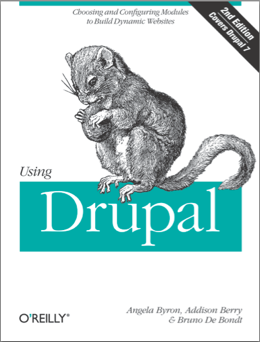 This book covers over thirty of Drupal's contributed modules in a practical, hands-on way. For beginners, there is step-by-step hand-holding. For advanced users, there is coverage on all the major "gotta know" contributed modules, so they can increase the number of tools at their disposal for their next project. Both e-book and "book" book versions are available now from O'Reilly Media, Inc. If you purchase the book through this link to Amazon.com, the Drupal Association will receive part of the proceeds. You may also read it on Safari Online! Also check out the Errata on O'Reilly's site.